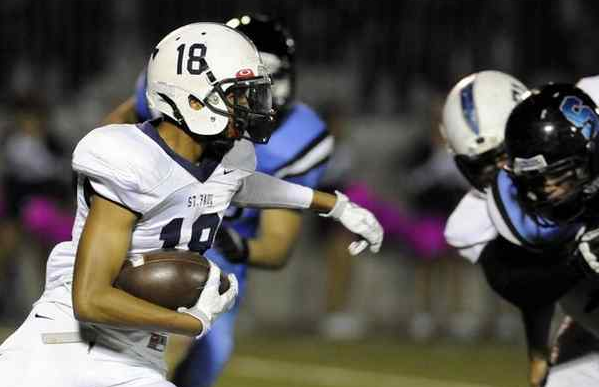 LOS ANGELES — St. Paul High School’s CIF Southern Section playoff hopes are alive and well. Armando Velasco scored from the 1 in overtime to cap the Swordsmen’s miraculous 42-35 victory over host Salesian on Friday in Angelus League football game. St. Paul (4-5, 2-2) stopped Salesian (5-4, 1-3) on downs to secure the victory. Early in the fourth quarter, it looked over. Deommodore Lenoir accounted for 478 yards and five touchdowns to lead the Mustangs to a 28-14 lead. Then the Swordsmen turned it over to its defense to get back into it. Matt Vela blocked a punt and Chris Garcia returned it 10 yards to cut the deficit to 28-21 with 9:03 to play. Anthony Lemos then returned a fumble 85 yards to tie it at 28 with 4:14 left. St. Paul then looked like it would win it in regulation when Salesian dropped the snap in punt formation and after a wild scramble, Garcia recovered it at Salesian’ 7. Velasco, who rushed for 103 yards and three touchdowns, followed with a run up the middle for a 35-28 lead with 2:18 left. But Salesian wasn’t finished. The Mustangs, keyed by Lenoir, drove 73 yards and tied it at 35 on a 19-yard pass from Lenoir to Ajani Johnson with a minute left. St. Paul’s defense then came up big in the overtime, sacking Lenoir twice before he threw incomplete on fourth and 9 to end the game. WHITTIER — The La Serna High football team, behind six touchdowns from senior running back Matthew Marshall, defeated rival California 45-17 on Friday night at Cal’s Sandra Thorstenson Stadium in a Del Rio League game. Marshall ran for a game-high 277 yards on 11 carries. Marshall, who broke his own school record in the regular season, also ran for six TDs against Cal last season. The victory set up a showdown Thursday between the Lancers and Santa Fe, a 41-0 winner over Pioneer on Friday. Santa Fe last won the DRL title in 2011, which was the last time the Chiefs defeated La Serna. With the victory, No. 9 in CIF Southern Section Division 3, improved to 6-3 overall and 4-0 in the Del Rio League. Cal fell to 4-5 overall and 1-3 in league. La Serna now has won 13 consecutive Del Rio League games. BELL GARDENS — The Schurr High football team continued its quest for an Almont League title with a 68-13 road win over Bell Gardens on Friday night. Schurr will head to Alhambra in the regular-season finale with both teams tied for second place in the Almont League. The winner will surely hope Bell Gardens can hand Montebello its first league loss as the Lancers visit the Oilers to wrap up its season. Bell Gardens (2-7, 2-2 Almont League) opened the game with a shanked 21-yard kickoff that encapsulated the rest of night. Schurr (6-3, 3-1) scored later that drive when quarterback Miguel Aguero connected with receiver Lance Babb on a screen pass and Babb scampered down the sideline for a 34-yard touchdown and a 7-0 Spartans lead. Bell Gardens had a rough time tackling Spartans ball carriers the entire night. Of Schurr’s 10 touchdowns on Friday, seven came within the first three plays of the drive. Four Spartans touchdowns came on the very first play of the drive. On the first play of Schurr’s second possession, Aguero hit receiver Francisco Remigio on a slant pass. The Lancers defense crept up expecting a run, and Remigio didn’t have a defender in sight as he ran 87 yards for a 14-0 Spartans lead. Schurr quickly added to its lead after Bell Gardens fumbled the ensuing kickoff. Two plays later, running back Noah Rangel ran 18 yards for a 21-0 Spartans lead midway through the first quarter. Schurr led 41-0 by the time Bell Gardens scored just before halftime. Lancers quarterback Agustin Velasquez threw to Randy Herrera in traffic near the goal line and the senior fought his way into the end zone to cut the Schurr lead to 41-7. Madison Wheeler scored on a 91-yard run with a minute to play to get the Highlanders back on the winning track in the Freeway League. The Indians had pulled to within 30-27 with 1:29 to play. La Habra (5-4, 3-1) was called for several personal fouls and the Indians (3-6, 0-4) tried an onside kick from the La Habra 30. The Highlanders recovered on the 9. The victory was La Habra’s first after a 27-13 loss to Buena Park ended 47-game league winning streak last week. La Habra quarterback Zach Fogel completed 20 of 34 passes for 190 yards and two touchdowns. He rushed for 77 yards and a score. Prince Ross rushed for 31 yards and a score and caught five passes for 69 yards and a TD. The Heralds rallied for the Olympic League victory at Whittier College, taking the lead for good in the third quarter and then getting a big stop in the fourth quarter in their season finale. Justin Osborn scored on a six-yard run to give the Heralds (6-4, 2-2) a 36-312 lead with 1:36 to play in the third quarter. The Crusaders (6-3, 1-2) drove to the 18-yard line, but Whittier Christian came up with the stop with 5:38 to play. Osborn scored his third TD of the game for a 44-31 lead with 2:09 to go. Village scored with a second to play. Quinn Commans threw two TD passes. 30 yards to Cade McGee and 82 yards to Osborn. The Herald are in second play in league play and do not play next week. 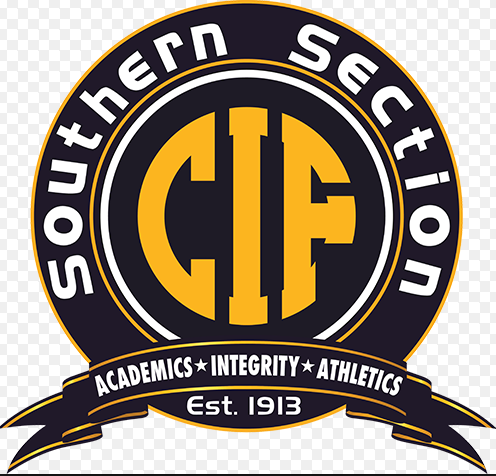 The CIF Southern Section office released the playoff groupings for the winter sports season, and Cantwell-Sacred Heart of Mary, arguably the area’s top two boys basketball teams the past few years, were both placed in the top division, IAA. Sonora, which won a division title two seasons ago, was also placed in 1AA. Whittier, which had its best season in nearly two decades last winter, was placed in 2AA. There are some questionable choices on the lists. I feel for Cantwell-Sacred Heart, because again despite having one of its better teams, the Cardinals appear to have no shot at a divisional title. Yes, they’ll be competitive and coach George Zedan will say its an honor to be placed in such a group, but a team should be placed in a group where it has some sense of winning the division if it plays well. Realistically, Cantwell has no shot. You could say the same for St. Paul girls basketball, which moves up from 4AA to 1AA? Yes, they’ve been successful, but that seems like a large jump. 1. La Mirada (7-2) — The Mats have not only dominated the Suburban League, they’ve dropped the 35-point mercy rule on each of its five league opponents, and the trend likely continues next week, and I’ll bet a few rounds in the playoffs. 2. 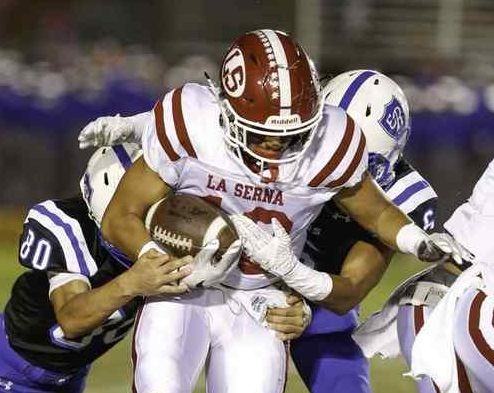 La Serna (5-3) — The Lancers have had three easy wins since Del Rio League play began. I expect La Serna to run the table in league play, but the next two weeks could be a little closer, even Friday when the Lancers renew their rivalry with Cal. 3. La Habra (4-4) — All good things must come to an end, and that includes the Highlanders league win streak, which ended at 47 games at the hands of the Freeway’s new king — Buena Park. The question can La Habra do any damage in the postseason? 4. Montebello (7-1) — The Oilers are quitely enjoying another strong season. They can clinch a share of their fourth Almont League title on Friday with the expected win over San Gabriel, which also positions them strong for a playoff run. Is this the year for a divisional title? They are in the running. 5. Santa Fe (4-4) — The have shown the heart of a champion, rallying for wins the past two weeks. They should have an easy one over Pioneer this week. But can they hang with La Serna next week? They’ll have to prove me wrong. 6. St. Paul (3-5) — The Swordsmen’s playoff hopes dwindle with each passing week. They can stop the bleeding with a win at Salesian. But are they up to the task? 7. Schurr (5-3) — This could be a scary team in the postseason. Beware of Sparta! 8. Whittier Chr. (5-4) — The Heralds are another team that could be scary in the postseason, if they get there. But as good as the offense has been, the defense hasn’t been up to snuff against good opponents. That has to change. 9. Whittier (4-4) — The Cardinals, after losing their first two in league against arguably the top two teams in the league, are trying to make another late playoff push. But will it work like last year. We’ll find out. 10. California (4-4) — The Condors have looked better, but last week’s late setback severely damaged their playoff hopes. An upset vs. La Serna will help. But can we expect it? I think not. Others: 11. El Rancho (2-6), 12. Cantwell-Sacred Heart of Mary (3-5), 13. Pioneer (0-8), 14. Sonora (0-8). 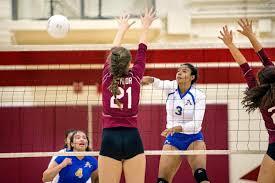 One loss among the elite teams in the San Gabriel Valley and it can set the Top 10 in turmoil. Glendora High School fell to Claremont in five sets in a Palomares League finale, creating co-champions. Both teams are ranked No. 2 in the CIF Southern Section (Glendora in Division 3; Claremont in Division 4), but with 14 teams ranked in CIF-SS polls, one loss was enough to send one-loss Arcadia to the top of the San Gabriel Valley Newspaper’s poll for the first time. La Salle had a huge sweep of Flintridge Sacred Heart and then a sweep in its Del Rey League finale to take over second.